Here's another reference-based GeForce GTX 680, this time from Point of View. 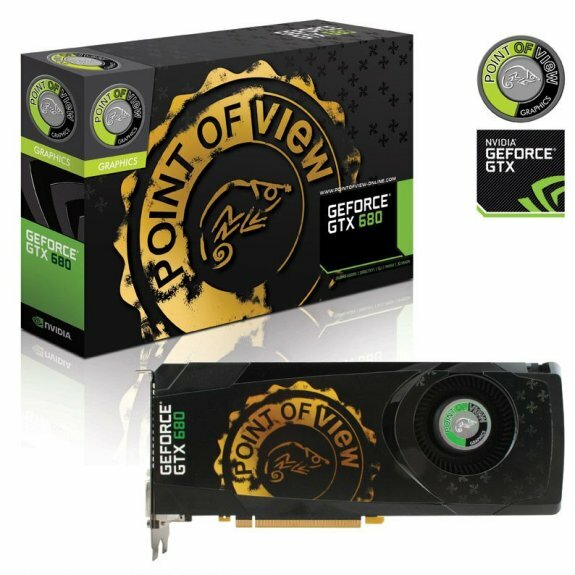 Point of View, a premier NVIDIA graphics partner and manufacturer of Android tablets, notebooks and other hardware, launches today the first card of the GeForce® 600 family: the POV GeForce® GTX 680. Current gen games have become more beautiful with higher poly meshes, larger textures and better shading technologies. In their quest for realism, game developers have demanded that we push graphics technologies to the limit. The DirectX 11 and shader model 5.0 supporting GeForce® GTX 680 is unlike any graphics card you’ve seen so far, performance wise and feature wise! The GeForce® GTX680 makes an amazing jump forward in raw processing power, performance enhancing features, connectivity expansion and increased energy efficiency and power management systems. Many of the new features are built on the next generation streaming multiprocessor SMX technology. One of these new features of the GeForce® GTX 680 is GPU Boost technology – an intelligent clock speed management which dynamically maximizes (or minimizes) your clock speed depending on the current demand. A slightly unexpected but still awesome feature is the Adaptive VSync function. The vSync of LCD monitors have always been a weakness for high performance gaming systems. LCD’s usually refresh at a rate of 60Hz (~ 60 refreshes per second) and offering less or more FPS can cause buffering issues and hick-ups. Adaptive VSync fixes this problem by intelligently adapting the graphics cards’ output vSync with your games’ frame rate. The result is a much smoother gaming experience. Regarding the internal rendering mechanics, a new feature is NVIDIA FXAA. Anti-aliasing has always been known to be very GPU intensive but NVIDIA has rebuilt this ‘edge-smoothing’ technique for maximum graphic improvement but minimum GPU load. With NVIDIA FXAA you are ready to turn on lightning-fast anti-aliasing in a huge variety of games, automatically! A huge leap in gaming immersion is the new 3D Vision™ Surround implementation. One single GeForce® GTX 680 allows up to 4 connected. Also up to three can be used to create a stereoscopic 3D “inside the game” experience while keeping an eye (the fourth ‘accessory‘ display) on your email, game-guide or social media page! Of course existing features such as NVIDIA 3-way SLI® Technology, PhysX®, PureVideo® HD and CUDA™ are again present to complete the package!